UPI (Utility Professionals Inc.) was founded in 2014 and is a thriving utility locating business serving the Virginia, Maryland, and DC area. We offer Subsurface Utility Engineering (SUE), utility designation, and utility mapping of underground utilities. UPI also performs records research prior to any utility mapping or designating. We use innovative technologies and equipment to detect the presence of subsurface utilities and mark the horizontal position on the ground surface. Our services follow the standard of the American Society of Civil Engineers (ASCE). Subsurface Utility Engineering (SUE) is a process of systematically identifying the quality of utility information needed to design a project and acquiring and managing that level of detail. SUE services help project designers manage risks by locating buried utilities through various methods for the design and construction of a project. UPI’s clients realize the value of determining where existing underground utilities are located during the design phase, mitigating conflicts and saving time and money during construction. Although UPI has historically worked within the Washington Metropolitan area, we have the capability to perform our services wherever we are needed. Our boots have been on the ground of hospitals, universities/colleges, federal and municipal buildings, and private development projects. We recommend using our services no matter how big or small the project, as our clients save time and money. Can’t I just call 811? UPI’s services should not be confused with One-Call services. All projects require a call to this service before you dig, however, they will only mark public utilities. 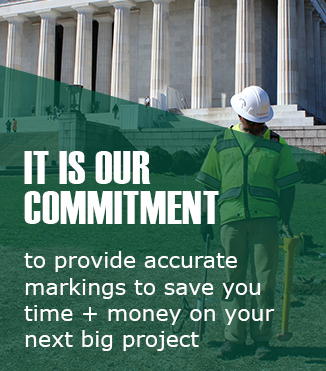 UPI fills in the gaps by marking these public utilities and all private utilities on site, ensuring more accurate markings and a safer construction site. In addition, we provide markings within 2-feet, as well as a deliverable of the site showing all markings and boundary lines.